Not as catchy as I contemplated, but the day pitchers and catchers report usually marks a new focus for the American Sports Landscape. You get predictions, it’s (newly inundated) but the clock’s ticking for free agency crunch time, rosters battles are waged as players jockey for roster positioning, and the fresh aroma of roster cuts lingers through the air. No better time of year, especially since every club is granted a new slate to which to engrave their fate. With the season rapidly approaching, spring training is the time of year which rejuvenates the baseball brethren. You get some real baseball (exhibition practice) but baseball more or less, despite the majority of us being in an absolute winter inferno. Speaking of Spring Training, it's also the time where newly added players begin sporting snazzy and brand new spanking merch and apparel. The Twins have infused their voids with many of these stop-gaps, budget friendly assets through free agency. Martin Perez, Blake Parker, Michael Pineda, Nelson Cruz, and C.J. Cron only begin the conversation of what new faces we probably might see play significant roles during the season. Among the most recently acquired faces, is Marwin Gonzalez. When reports surfaced that the Twins were interested in Gonzalez, let's say I was fairly reluctant that they would incline to pull trigger. And I assure, I wasn’t alone. But, sitting in biology class taking a genetics quiz I nearly lurched outta my seat as my phone buzzed incessentally. Let’s just presume that I wasn’t doing anything against the rules beforehand, but I literally couldn’t not stop smiling after I found out. But to my compadres, me enjoying this reprehensible quiz just added another layer of my peculiarity to my mantle. And in hindsight, I aced that quiz so who’s winning now…. 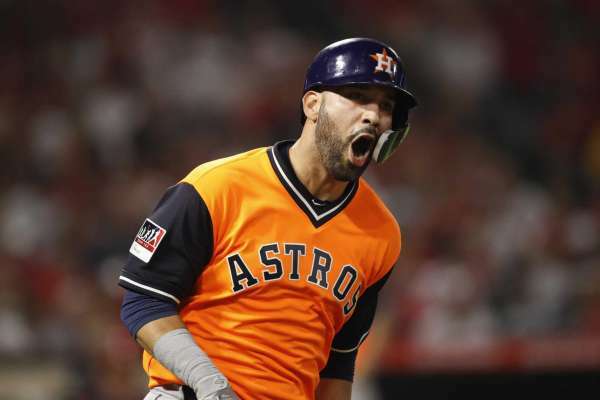 The Twins made some buzz and fairly interesting news on a Friday afternoon a few weeks ago, signing maybe* (we’ll get to that part later…) one of the under the radar gems of the free agency class—Marwin Gonzalez to a very cost-friendly 2 year, 21 million dollar deal. It’s funny how the Twins went from offseason failure to preseason sleepers in a matter of days after striking luck with the versatile man but…. 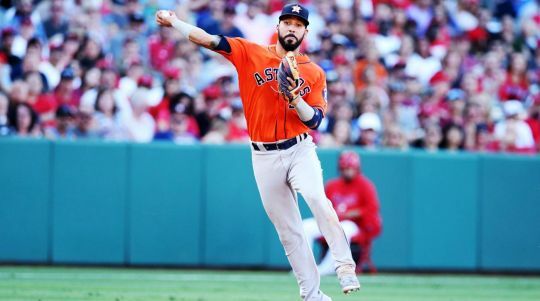 Dubbed the Jack of all Trades, Swiss Army Knife, Utility Man Extraordinaire and whatnot, Marwin Gonzalez was once a fabulous hitter in 2017. Prognosticators had thought he would have only bulked up the 2018 free agent crop, but a rough 2018 get-go depressed his stats and this suppressed market only further lessened his margins. 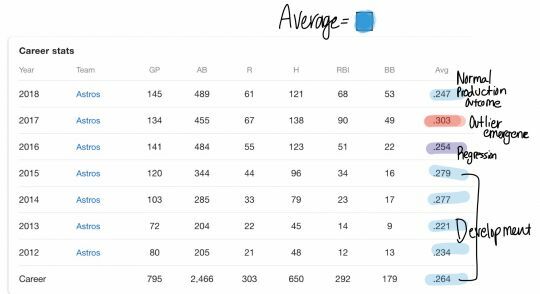 We’ll get to the intriguing tidbits later, but in short and sweet delivery Marwin succumbed to depreciation-itis and proved to be less a safety valve contributor to the Astros than his 2017 numbers would suggest. Reading around 2017 articles of Marwin, some tabloids had been lobbying for Marwin to push for MVP votes, and in retrospect it’s rather hard to believe. What comes to Marwin’s calling however is his insane versatility. The AL’s closest apparent to Ben Zobrist, Marwin played the role of super-utility during his time down south, and had a breakout 2017 campaign. Gonzalez should at minimum provide exemplary depth, but its clouds my judgement that the Twins went luxury over necessity (pitching). I’m further dumbfounded that bulk inning eaters like Gio Gonzalez and Dallas Keuchel still remain waiting for some appealing offers. My dumbfoundedness is further compounded because there isn’t any shortchange of any money to invest in some semi-lucrative contracts. Getting back to Marwin, I kinda do enjoy this veil of obscurity in what your getting in Marwin. So I dived in to his stats an…..
Marwin was super lucky in 2017. And he wasn’t in 2018. This explain his nondiscript aberration that soared him up into the 2017 MVP discussion. I spoke about wOBA and expected wOBA in my last article conveniently hyperlinked and located nearby here, but if you’re too lazy like me here’s a short snippet…. 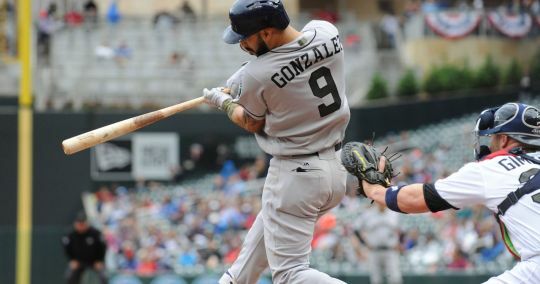 When I used Baseball Savant to tailor the pool with the highest differentials of wOBA and expecting, essentially denoting the most lucky hitters, I found Gonzalez at the top of list with a shocking amount of amassed luck. Which explains why he had a high.303 batting average. I would like to get more in-depth with his OBP and wider array of his totals in 2017 outlier season, but it's clear that luck isn't a sustainable trait and if you want more just go here. This offense now appears more meticulous and premeditated than a patchwork assembly in the years past, and with Gonzalez I think this has some sudden implications. I’m currently at work with my piece for my Opening Day roster prediction, but for now I can tell this lineup is going to kindle a lot of traffic on the bases and by implementing boom in the form of Cruz, Cron and Schoop it has loads of boom or bust potential. I going to admit even I couldn’t have fathomed a offense this dynamic would actually be wearing Twins uniforms coming into the 2019 season. Yet I feel the rhetoric is still glass half empty (alluding to the pitching fronts). Yet I feel this offense can compete with the premier firepower offenses of the AL (on paper at least). Could we be entering the dawn of a monolithic juggernaut? My jaded and (not level headed) convoluted glasses lenses having me saying that. Or I’m probably just super pumped. So far what the Twins lack in is pitching. But no so long ago, did we see a frontline staff make the postseason with BARTOLO COLON, DILLON GEE, MATT BELISLE, and HECTOR SANTIAGO’s elicit shells manning our staff. Aside from the much more stiffer completion, there resides a little recurring theme in all the Twins moves. They’re banking on the bouncebacks. Hildenberger, Reed, May, Pineda, Buxton, Sano, and many more are players that in a perfectly Twins oriented world should be able to recreate their peak performances or fulfill their prospect potential. All we can do is let it unfold before our eyes. So take a seat back and hunker down on a menacing joyride of hell that is the Twins season. I’ve been preaching for the Twins to sign a high-caliber relievers to shore up the bullpen all offseason, at such a profound volume that I’m starting to feel like I’m sounding like a broken record. But imagining Kimbrel in our bullpen gets me hyped just even envisioning it, and any passable reliever you’d be even marginally comfortable handling the 9th inning would get my red stamp of approval. This makes me wonder why I would be resistant or even hesitant on with signing a premier commodity over some cheap flyers (no offense) in the case of Gonzo, Cruz and Schoop etc… It’s because of Sano and Buxton. No undisclosed, or half hearted excuses. This is the final tryout act. So let's speak a little speculation, shall we. What I don’t understand about this transaction or move is that Gonzalez does nothing more than clog your opening day roster picture. Do I like him getting at bats over guys like Taylor Motter, Johnny Field etc? Yes, without a doubt. But this storyline of not addressing the pitching staff, especially since your offense looks to have the physique of a semi-adequate batting company, and that your bullpen and rotation coming into the offseason was far and away your most glaring area of weakness is just beyond baffling. This offseason has had the makings of a proverbial A+ grade, yet I just don't understand HOW you can entrust Pineda and Perez to eat 150 innings because they haven’t in the slightest shown any ability to provide quality innings much less stay off the shelf, and realistically expect repeat performances from the career seasons of Kyle Gibson, and Taylor Rodgers. Do I like the Crux, Cron, Gonzalez, Schoop moves? No, because they're moves to die for, because they are plausible bounceback candidates. But for heaven's sake can we draw the line between salvaging careers, and deals made in vain because Addison Reed and Blake Parker's diminishing velocity aren't nearly going to do the trick on tepidly retooling this bullpen. For all I know, they could have had noble and sincere intentions to actually recruit an impactful reliever, yet I just can't get myself to give them a decent and partially deserving grade, which just leaves an apologetic taste in my mouth. Sorry. "Cannot play with them, cannot win with them, cannot coach with them. Can't do it. I want winners. I want people that want to win." Follow me @Sabir_Aden. Thanks for reading and remember always feel free to voice in below in the comments. Well, so long until next time.